I take pride in the fact that my child likes fruit. I mean sure it’s sugar, but it’s a natural form of sugar, right? If the child would prefer an apple over some m&ms then I say, knock yourself out. However, there are limits. That’s right people. 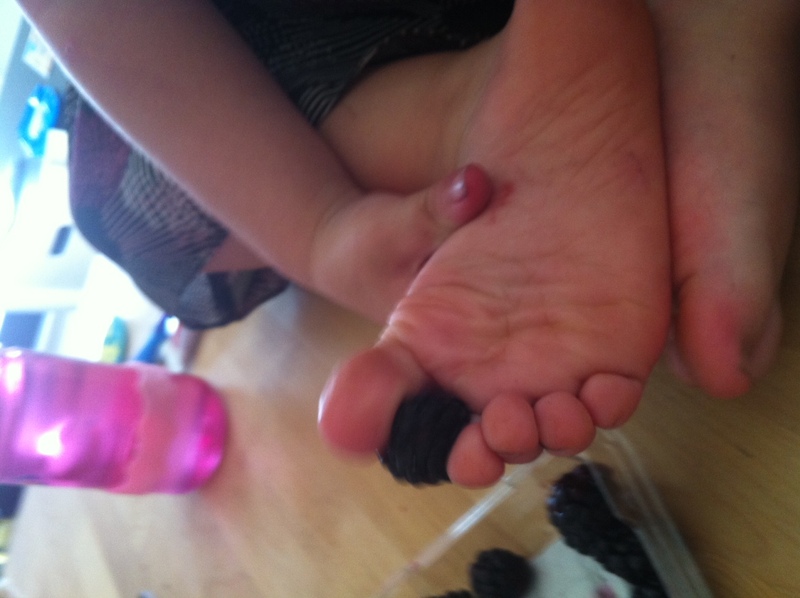 That is my child holding a blackberry between her toes. I guess I shouldn’t be shocked, she loves to pick things up with her toes, but fruit?!? EW. Of course, as with all things, it gets better. Oh yes, she actually used her toes to put the blackberry in her mouth. Yes, I let it happen. Twice. Yes, I took pictures. I know. I’m a bad parent. What else am I supposed to blog about? How else will I embarrass her in front of her friends later in life? Sometimes these things have to be documented. I’m not making this stuff up. This is my life. I think we’ll have to cut back on our frequent trips to the zoo lest she start asking for raw meat next. This entry was posted in Parenting: AKA - I Don't Know Any More Than You Do. Bookmark the permalink.